This slow-growing sage bush displays lavender flowers. The shrub can be excellent in pots or naturalized to the landscape and provides a 3 ft' span that slowly grows outward. The leaves are a darker green than the average sage's, providing a natural backdrop for the flowrs that attract hummingbirds, butterflies, and pollinators. 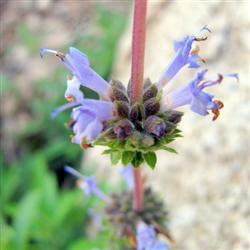 A continually flowering sage that needs little water and is very drought tolerant. Can do well being placed in rougher soils to provide color.